Collaboration during archaeological projects have not always been valued, but today archaeology students, like us, learn that we not only can learn more from communities we study, but we can help bring knowledge back into that community. Valuing the assets that community members means taking time to meet with them, take into account the emotions brought up by these projects, and learning how to compensate them. Although there are challenges faced on both the community and the archaeologist’s part of collaboration, the transfer of knowledge makes the stories told by the project at the outcome that much more valuable. I thought it was particularly important how Professor Gonzalez talked about not only compensating communities with a return of traditional knowledge, but also financial recompense. Sharing histories and personal stories is a form of labor that should be respected and treated as such, as is the time that community members take to meet with archaeologists and any other academic studying their culture or history. Museums, too, play a major role in the collaboration between indigenous people and academia. This quarter, I have been able to see how the Burke Museum collaborates with the communities from which collections objects originate. One of my classmates, for example, is part of a Oceanian student research group that conducts research on objects in the Burke’s collections. The meaning and understanding that they gain is often through stories that the students are able to tell. The Burke Museum also collaborates with the public so that objects that members of the public are culturally associated with can come and view the objects in person. The open relationship between academia and the public also extends to museums and other institutions, and I think our very own Burke Museum is a good example of such a relationship. The chairs at the Preserving the Past Together workshop were literally locked together. To create small groups for discussion participants had to work together to pull apart the chairs. Dr. Gonzalez made an interesting comment about how the chairs represent archaeology’s structural impediments to collaboration and it had me thinking about that metaphor more deeply. If individuals want to work together but the system does not allow that to be easily implemented, how do we break apart the “chairs” toward a more collaborative archaeology? The questions raised by the audience also mirrored this concern. How do we find the time, personnel, and funding to build meaningful collaborations? In the lowest bidding environment, the cheapest bid wins. How can archaeologists demonstrate that working with tribes is an asset to the project and not a hindrance? Dr. Gonzalez mentioned that working with tribes from the outset of CRM projects saves money. Long term planning and relationship building seems to be a useful strategy for saving money and for demonstrating the worthiness of collaboration. I think that in these beginning stages of collaboration it will take many individuals putting in overtime, going above and beyond their bids, and being creative about how to reach out to tribes. We may have to swim against the current until the tide changes. Breaking apart the chairs, breaking apart structural impediments, and breaking apart attitudes will be a long battle, but a battle worth fighting. Often archaeology is taught and viewed from the side of a university, indigenous people and groups are often viewed as passive agents and are sources of information. That information is extracted and used for the benefit of the universities rather than the tribe. The direct descendants or cultural descendants of a community are often not the ones uncovering and publicizing information and discoveries about archaeological sites. This separates indigenous groups not only from their history but from modern society, when someone else is writing their history it’s easy for others to forget their existence and remember them as something belonging to the past. The Meaningful Collaboration workshop was a brilliant educational reminder of these facts. As a student of archaeology I believe these workshops explore important aspects to the discipline which have either been ignored or unidentified as sources of conflict between indigenous groups and archaeologist. Instead of extracting information archaeologist should work alongside, or even for, indigenous groups to build relevant knowledge for these groups. As scientific the discipline wants to appear, when working with descendant populations the information uncovered does not belong to the archaeologist, it belongs to tribe. When gathering information it is important to consider how one is interacting with indigenous groups, the Modes of Interaction chart shown during the workshop, highlights what these different modes look like, from one of colonial control to one of indigenous control. Personally I believe that either a mode of indigenous control or one of collaboration should be used depending on the situation. Although overall an archaeologist should strive to work for an indigenous group, rather than working for their own benefit. One of the most important questions that this workshop raised for me was how archaeology should be conducted to be beneficial to those it effects the most. As a student, it’s enlightening to hear about the challenges faced by those in the field of archaeology. Whereas in an academic setting we focus on theories or frameworks to guide us, other real world issues in archaeology arise such as financing, bureaucracy, and limitations on time. Utilizing a focused framework to apply to an archaeological project is an essential tool, and can help to guide the design of the project. Yet this alone cannot lead a project when the history of a community is being explored. Above all, it is important to remember that at the forefront of archaeology today should be respect and collaboration. This theme was a key component of the Preserving the Past workshop and the reception of this idea shows the positive changes happening in archaeology. Panelists and attendees whom addressed these issues were frank and forthcoming about the challenges they’ve faced, and it provides a broader perspective to archaeology in practice. Like other students, I found the breakout sessions informative as well. One attendee spoke about the positive changes she had witnessed in archaeology during her education, and that progress is deeply encouraging. I was intentionally late for this presentation. Not because I didn’t care or didn’t want to go but because I had a class until 1:20 which made it difficult to make it on time. But, because I was late I didn’t get to collaborate in the groups because they where already established. Well, yeah I could have but I really wasn’t in the mood to interact with people more than I had to that day (I wasn’t in a good mood). Although, there was a few key points that I got out of the lecture and discussion. First, if you don’t read more of this blog at least read that the bases of Indigenous archaeology is communication and respect. Without these two things there would be no collaboration. One of my favorite lines goes something like “In the scholarly sense it is I … but in the traditional sense it is WE.” (Sven Haawkanson, curator of native american anthropology, Burke Museum) It is important to remember that when you are working with tribes, they make their culture with you. It was also pointed out that there are a lot of restrictions to this method. Especially when it comes to a persons position in there profession. If the people higher up in the chain do not agree with these methods its hard for individuals under them to change much. This doesn’t leave much hope for the future but remember large frameworks like this take time to catch on. Be patent and resilient, and you’ll make a difference. I was excited to attend the second workshop in the Preserving the Past Together series last Thursday. I thoroughly enjoyed the first workshop and was eager to build on that experience. Also, I was excited to hear Chip Colwell-Chanthaphonh speak. I have read some of his work and discussed his concepts in several classes, so I was curious to see what he was like in person. As a student, the authors that we read can sometimes appear intimidating and inaccessible, so I was thrilled to confirm that Dr. Colwell-Chanthaphonh is a normal human being. One point that he brought up was that collaboration between archaeologists and Indigenous peoples is not always going to look the same; it can take multiple forms and can vary over space and time. The important thing is that the needs of the archaeologist do not trump the needs of the tribe, and that the tribe sets the terms of engagement. The archaeologist’s goal should not be to extract knowledge from the tribe, but to generate knowledge together. Another aspect of the seminar that I really enjoyed was the interactive component. During the workshop we separated into smaller groups and had the opportunity to share our thoughts and hear from multiple people. My group consisted of UW faculty members and an individual who works at a local museum. We discussed how to address colonialism in archaeology and came up with several useful approaches. For one, developing reciprocal relationships is extremely important; historically, relationships between archaeologists and Indigenous peoples have been hierarchical which has proven to be harmful. Another solution is to confront colonialism head-on and put it at the center of archaeological projects rather than skirting the issue. Although some participants appeared to be less optimistic than others, I think it is important that we as students immerse ourselves in these kinds of discussions. If we learn to approach archaeology from a collaborative standpoint and focus on developing reciprocal relationships rather than exploitative ones, we can change how archaeology is done in the future. The second workshop of the “Preserving the Past Together” seminar series had a guest key note speaker, Dr. Chip Colwell, senior curator of anthropology at the Denver Museum of Nature and Science. I walked in half way through the lecture and was glad to see the room was full of people because the types of the conversations that are occurring throughout this series need to be discussed more often. It shouldn’t just be for individuals in the archaeology field, but also among those in museums, history, cultural resource management and any discipline that is involved with some type of historical preservation, including tribal preservation. One conversation that arose was the creation of knowledge and what to do with it. Sure, there is some public outreach to educate people about new discoveries. But more often than not, the information does not reach the community it should be reaching. Several of the panelists addressed the importance of sharing the knowledge with the community related to the space where the knowledge is produced. Academics shouldn’t share their knowledge just among themselves, but back with the community itself. This is probably one of the last, but equally important steps to take when working in a collaborative archaeology project, a main theme in the overall series. Two other important aspect of collaborative archaeology that I took from this seminar were knowing how to listen and knowing when to step away from the collective. There are more workshops in the making that will be produced this academic year, but if there is one word that can sum up all of these themes and topics its respect. In the second workshop of the Preserving the Past Together Seminar Series, there were presentations separated by break out sessions. What stood out to me was the conversations that we had during the break out sessions. I was in a group with several people that worked for tribes, people that worked for the state in planning, heritage managers and a few others. I believe we were all there with a similar vision in mind for the future; restoring sovereignty and authority to indigenous peoples in respect to their cultural heritage, acknowledging the fact that colonialism has never ended. However the perspectives and attitudes of all the individuals participating was vastly varied. The students in the group were excited and optimistic that we were having these discussions and we were focusing on these topics in our classes. While many individuals working for the tribe seemed to share optimism with the students, they were the first ones to point out that they are still felt very helpless when it came to working with people outside the tribe, weather it be firms or universities. They pointed out that they could create barriers for outsiders to pass, but they could not stop any work from being done on tribal related cultural property, it would be done eventually – no matter what. While this was a bit disheartening to hear, it is a sign that there is still a long road ahead of us to refining and strengthening this collaborative system. From my own experience in our educational system I feel confident that the future will bring stronger relationships and more care for the culture of those around us. It is exciting to be alive during a critical turning point for cultural preservation in north america and to be part of these invaluable discussions. How Do We Preserve the Past? During the Preserving the Past Together seminar last week, representatives from cultural resource management firms, government agencies, and tribal historic preservation offices gathered to discuss challenges, benefits, and ways to improve collaboration in the future. While listening to the poignant remarks on something as sensitive and important as handling and preserving indigenous culture, I, like most 19-year-old girls, found myself thinking about myself; how I could learn more, and how I could get my foot in the door. Eventually, the conversation shifted to university interest, especially how the University of Washington could help. One way universities help is by creating interest in students as well as the general public. For instance, the Burke Museum (associated with UW) has an annual “Archaeology Day” where families and community members come to play games and learn about artifacts. Another point about universities was more curriculum based. According to some of the workshop speakers, UW should offer more classes and research opportunities based around local archaeology, instead of grooming students to specialize in other places of the world. This particularly spoke to me, as I have studied abroad in Spain, and strongly consider focusing in the archaeology of that region. After this seminar, and some of the discussions we’ve had in class, I’m starting to wonder where I have the right to practice archaeology. Although I identify as an American, I wouldn’t necessarily feel comfortable digging and interpreting Native American artifacts, as it’s not my history to tell. Hopefully, with seminars like these, collaboration between archaeologists, universities and tribes will improve, giving a place for non-Native Americans to support tribes in their attempt to preserve the past. “Preserving the Past Together”. 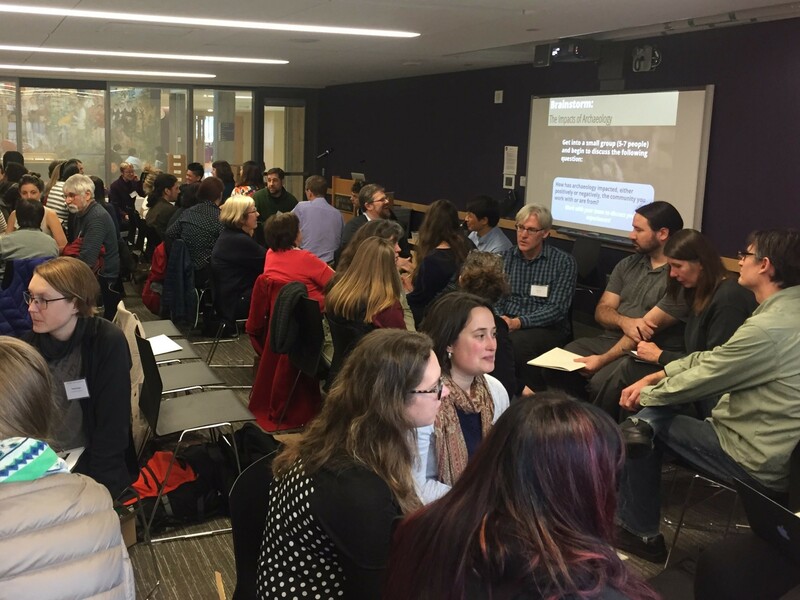 Seminar, from College of Arts & Sciences, Office of Research, Anthropology Dept., Quaternary Research Center, wǝɫǝbʔaltxʷ – Intellectual House Academic Planning Committee, Burke Museum, and Simpson Center for Humanities, Seattle, January 12, 2017.